Looking for bookshelves and wall shelves to boost storage in your home office, bedroom or living space? Anyone who’s ever dreamed of owning a Regency-style library, floor to ceiling with leather-bound books will know that bookcases have their place, but if you’re stuck for floor space, or would otherwise prefer a more open-ended option, bookshelves and wall shelves make just as good a home for those prized titles. Looking for more book storage ideas? Find them in our design guide. Open-ended shelves are best when it comes to not hogging all the visual space in a room, however it’s worth considering how annoyed you’ll get constantly righting books that have taken a tumble, or how a set of bookends would fit in with your overall design. If we really had to choose, our favourite open option would be Brick & Barrow’s Aramantha Reclaimed Floating Shelf for its low-key looks and solid build, although there are plenty more where that came from. Alternatively, do away with the whole sorry business altogether and go for a wall unit that keeps books where they’re meant to be: on the shelf. Our best bookshelf overall is the Elegance Gold Metal Shelf Unit from Maisons du Monde which keeps your most impressive-looking books at the forefront (anyone with a copy of Ulysses that isn’t currently being used as a doorstop, raise your hand) while concealing clutter. For all of our other picks, continue reading below. This beautifully versatile solid wood floating shelf has the uncanny ability to suit almost any interior style, from so-now industrial to country kitchen, thanks to its minimal design and natural materials. It’s crafted from solid pine, but comes in a great range of finishes including walnut and four shades of oak, each of which bring out the grain beautifully for a real high-quality ‘found’ feel. Its reviewers agree, too, saying the quality is tangible and the finish stunning. Statement shelving is a great way to really make the most of a prized collection, whether it’s of books or something altogether different. This circular shelf from Maisons du Monde is such a thing, with industrial-style good looks and a large footprint that makes a feature of any wall, while the open sides keep it from feeling too closed-off. It’s also phenomenally good value, considering its high-end design, proving you don’t need to spend a bundle to make a statement with your storage. Short of rummaging through markets and sales sites, it can be very difficult to find shelves for period homes that don’t look anachronistic or just plain odd. That’s where the Belle Isle floating shelf from Breakwater Bay at Wayfair comes in so handy. The simple white paintwork gives it a clean, fresh look and a neutral palette that allows it to fit in with a wide range of schemes, while the cornicing-style details are beautifully fitting for traditional living rooms and kitchens. However, they are quite small, so you’ll want to pick up a few or leave them for your very favourite reads. Kids' book storage solutions like these ones from the Great Little Trading Co are a very special kind of blessing when it comes to designing children's bedrooms. 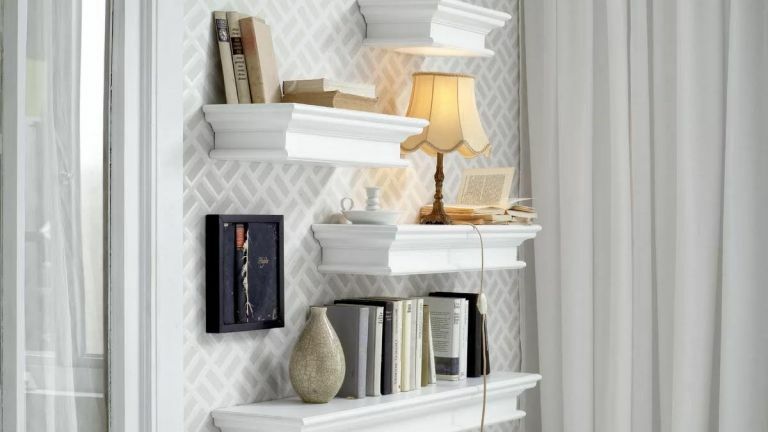 A set of three differently-sized house-shaped shelves, you can configure them however you want, in a line or gallery wall-style, and use them to keep a carefully curated selection of books close at hand. Their brightly coloured interiors make them great for showing off favoured trinkets or for toy storage, too. Storage ideas for a small house can be the trickiest to find, but corner shelves are a great solution for when wall space is lacking. This one from Hokku Designs at Wayfair comes in a choice of fire-engine red, modern black, minimal white or rustic oak, offering something to suit pretty much any space you have in mind, while its upticked ends make it great for books, meaning no need to shell out for separate bookends.